The big show is back! This episode I talk about some FUN comics, including two all-ages books–Molly Danger and Pix–and one book that is for more mature readers but is still a lot of fun to read: The End Times of Bram and Ben. There are some spoilers abounding, so you have been warned. So, sit back, relax, and find out just how these comics are more fun. Like all that and a bag of tangelos, Comic Timing is back with another brand new episode! This time, Ian sits down at the computer to chat with longtime friends of the show, Jamal Igle and Shawn Pryor to discuss their latest ventures! For Jamal, that is the Kickstarter campaign for Molly Danger: Book Two, which is now in its final week (so go ahead and pledge RIGHT NOW!). For Shawn, he has a new Kickstarter available that he has created called Cash & Carrie, which has officially past its initial goal and is now looking to hit some stretch goals. Both of these projects are near and dear to me, so I do hope you all take the time to give them a thorough look, listen to the episode, and then donate what you can to each project. Or heck, even sharing them on Twitter, Facebook, or Tumblr helps a bunch! And speaking of Twitter, you can find jamal and Shawn on Twitter too @JAMALIGLE and @shawnrpryor. On August 22-25 you can go see Juan Castro who is a guest and Fan Expo Canada and after that you can head on over to Baltimore Comic Con happening on Sept 7-8 where Darrell, Chris Campbell , and Tom King will be in attendance. Also check out Juan in an interview about his work on Jamal Igle’s Molly Danger http://comicshavok.blogspot.mx/2013/08/interview-with-molly-dangers-inker-juan.html On this crazy episode we have the return of everybody’s favorite Drunk Chris Campbell and special guest artist Drew Moss whose most recent project The Colonized from IDW just wrapped up. We also discuss Faction leaving F4, Morrisson on the intended Killing Joke ending, Infinity, Suicide Risk, Batman Annual 2, Flashpoint Paradox, and in the hipster d bag segment the hipsters talk Spring Breakers. Another month already? 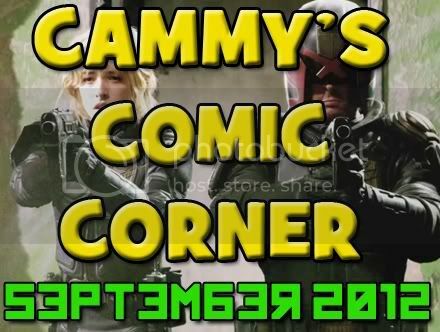 That means it’s time for Cammy’s Comic Corner for September 2012! [1:19] Dragon*Con discussion with Chandra Free! [37:32] DC’s New52: One Year Later with Chris Thompson! [1:06:16] Judge Dredd and DREDD 3D movie review! [1:15:36] Molly Danger victory lap with Jamal Igle! Send questions, comments, suggestions, and concerns to CammysComicCorner@gmail.com! Here we go with some more Comic Timing! This episode is chock-full of goodness, as Ian is joined by two of Comic Timing’s most awesome guests: Jamal Igle and Shawn Pryor! We discuss Jamal’s new Kickstarter campaign in association with Action Lab Entertainment, Molly Danger, as well as Kickstarter in general, comics in general, life in general and maybe even Generals in general. Okay, maybe not the third one. But there are some delightful musings about Ewoks! As always – we are sponsored by DCBS! That’s right! Discount Comic Book Service! For those of you who have not used DCBS before you can save an additional 8% off your first order via the promo code: CT8. Plus, be sure to check out DCBS’ new Comixology digital store! You can e-mail the show at comictiming@gmail.com and be sure to Like us on Facebook at http://www.facebook.com/ComicTiming. And do make sure to donate to Jamal’s Kickstarter Campaign if you have the time; any amount you can give helps make Molly Danger become a reality. And as always, thanks for listening and we’ll catch you next time! The PKD Black Box #83: Molly Danger and the Power Principle. Tangents aplenty also follow as things such as Megaforce, classic Janet Jackson and other random topics are discussed. This is the one I have been waiting for everyone The Dark Knight Rises. I will discuss and review in detail not just TDKR but the whole Christopher Nolan Batman Trilogy. Also I will discuss what is the lasting effect that this series not just have in the current world of Comic Book Movies but the future as well. Plus if that wasn’t enough we do over some of the big news that came out of SDCC 2012. Enjoy!